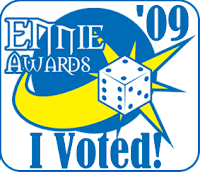 The Mouse Guard RPG is nominated for 3 ENnie awards! Best Interior Art, Best Production Value, Best Product of the Year. The winners are determined by online popular vote (which are only open for a few more days), So the only way we can win is if fans make a push and vote. You don't have to vote for every category, so if you only want to support Mouse Guard in your voting, that's fine. Here is the link to the ballot, and thank you in advance! I'll be spending most of my time in Artist's Alley AA03. I'll also be signing at the Archaia Booth 2635 once per day. Check the Archaia booth for a schedule of my signing times as well as the signing times of other Archaia creators. Friday July 24th: 11:30-12:30 Comics Arts Conference Session #6: Can College Prepare Creators for Comics Careers? Sunday, July 26th 11:30-12:30 Spotlight on David Petersen. 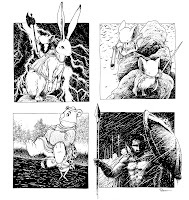 David Petersen will talk about his Eisner Award winning series Mouse Guard, how it came to be, the process that makes it happen, and what the future holds for his mice. Discussion will be moderated by Nick Tapalansky. audience Q&A will follow the moderated discussion. Sketches: I plan on doing free quick mouse doodles in any Mouse Guard hardcover (either purchased at the show or brought from home.). 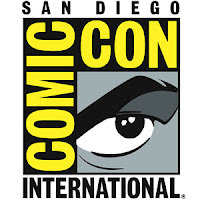 This should answer any SDCC Q’s…but feel free to post other Q’s as comments and I’ll try to answer them ASAP.